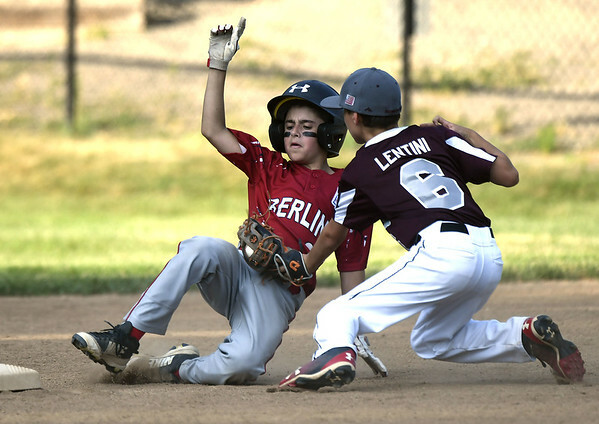 BRISTOL - Rocco Davino and Connor Lentini have become quite the duo for the Southington South 10U Little League all-stars. It wasn’t more evident than on Tuesday night. As Southington South lifted the District 5 championship banner, the two players were especially key in the deciding Game-3 win over Berlin. Davino pitched 5.1 innings of one-run ball while Lentini, a shortstop, had a pair of hits, including a leadoff double in the fourth inning to kick start a three-run rally for Southington. Leggett said after the game his team’s depth in the rotation is one of its strong suits. But Davino has stood out as someone who can get the big outs when the team needs it most, something he proved against Berlin. Lentini has been Southington South’s leadoff hitter all season has shown there isn’t much he can’t do from the batter’s box, whether it’s finding a whole to get on base, moving a runner over or causing havoc on the bases. But for him, the mindset is simple. Leggett knows he has one of the best players in the area at his disposal. But it isn’t Lentini’s ability that impresses the coach. It’s his mental approach to the game. Southington will take on Simsbury, the District 6 winner, in the first game of the sectional round Friday night. But with players like Davino and Lentini leading the charge, there’s no telling how far they can go. Posted in New Britain Herald, Southington on Wednesday, 11 July 2018 17:45. Updated: Wednesday, 11 July 2018 17:55.